If we are honest, most of us would have to admit to being scared by what we read in the Bible. I have had my own fears (that I will discuss below) which I thankfully conquered years ago. The solution came through the answers found while researching my book Know the Future  similar to how reading it brings peace to readers. The first and most common fear usually happens immediately when something finally inspires a believer to start digging into Bible prophecy himself. Y2K speculation did it for me in 1999. 2012 Mayan Calendar  speculation did it for many others. Then the 2015 blood moons caused a tizzy and increased interest in Bible prophecy. Solution: I subdued this fear by learning God's plan for his people to escape those winds along with everything else Wormwood causes. I kept studying and in early 2003 I saw God's escape plan for “his people.”  That, then, was the last time I was ever scared about the end times. I learned that rather than there being a celestial escape plan (pretrib rapture), there will be a terrestrial one (a migration). You can see this escape plan in Revelation 12 and Joel 2:30-32=Rev 6:12-17, among other verses. My previous article on going through the Great Tribulation  also discusses related concerns. For example, watching things worsen to the point that people declare “it's never been this bad” is not a good indicator of the end. Most generations have seen things get worse than they were previously. Whenever this happens, predictions that the end is near multiply. Nevertheless, civilization keeps going on. The lesson from this is that we most likely have more time than we think, even now. We can trust that when we do not have much time left, God will send a prophet to clearly let us know . I would bet that even my children finish school or get married before the end comes (although I think they will see the end in their lifetime.) It's the safe bet; History is on my side. More importantly, as yet, none of the “beginning of sorrows”  events that Jesus spoke of in Matthew 24 have happened yet. Until these do, he said “the end is not yet.”  There is no sign they are even ready to happen. One of the themes of my research is giving good Scriptural evidence for why it's impossible for the end to come in the majority of the years ahead. 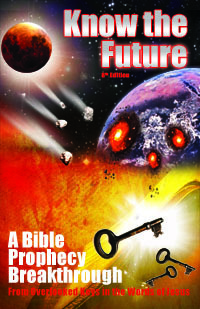 I'm the anti-date-setter among Bible prophecy experts. I can debunk just about all the dates out there using my book's roadmap timeline. The timeline shows the possible windows for the start of the 70th Week of Daniel using the Sabbath year cycles that the 70 Weeks are aligned on . In other words, in only one out of every seven years can the end start (or can Jesus return). One thing I know for sure about our coming exodus is that we will have healings. As mentioned above, we will have up to 144,000 prophets throughout the world at that time . When Jesus sent out their forerunners, the 12 and the “72” they were commanded to preach, cast out demons and heal. We see the 144,000 in Revelation 7 and 14 sealed with the name of God and protection. Joel 2 mentions the pouring out of the spirit in connection with the coming of the blood moon cosmic disturbances. Peter quoted that very passage on the day of Pentecost when the spirit was poured out on that generation. You can read about all the healings that followed throughout the Book of Acts. Given all of this, it is safe to expect that if you need a healing because you are too old or too afflicted by the “diseases of Egypt” (Dt 7:15) in order to comply with the command to flee Babylon (Rev 18:10), you will have it. God is consistent, merciful and reasonable. As you may have noticed, most end time fears come from ignorance or misunderstanding. The prescription for that is education. If you have a fear from end times topics, you must push forward past the fear into further study until you understand enough or correctly in order to dispel the fear. My articles and book  can get you there faster.